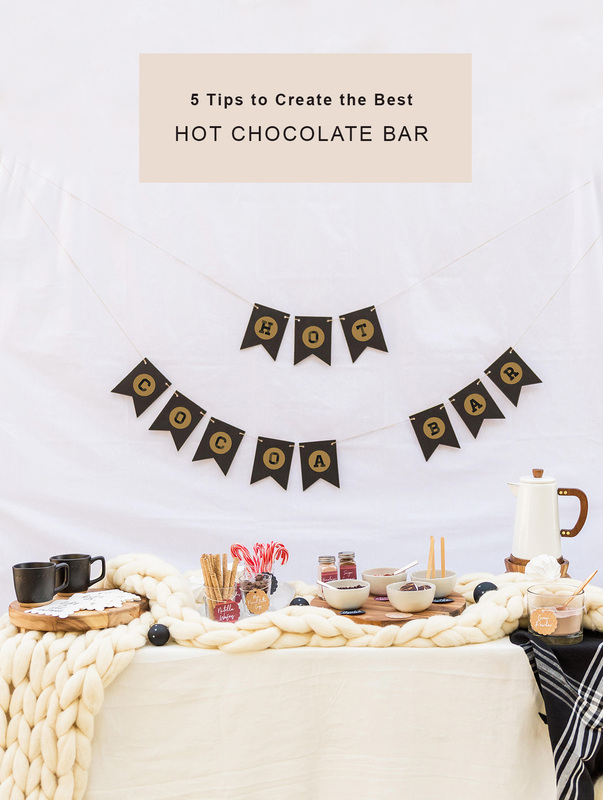 How To Spice Up Your Hot Cocoa Bar With 5 Tasty Tips! 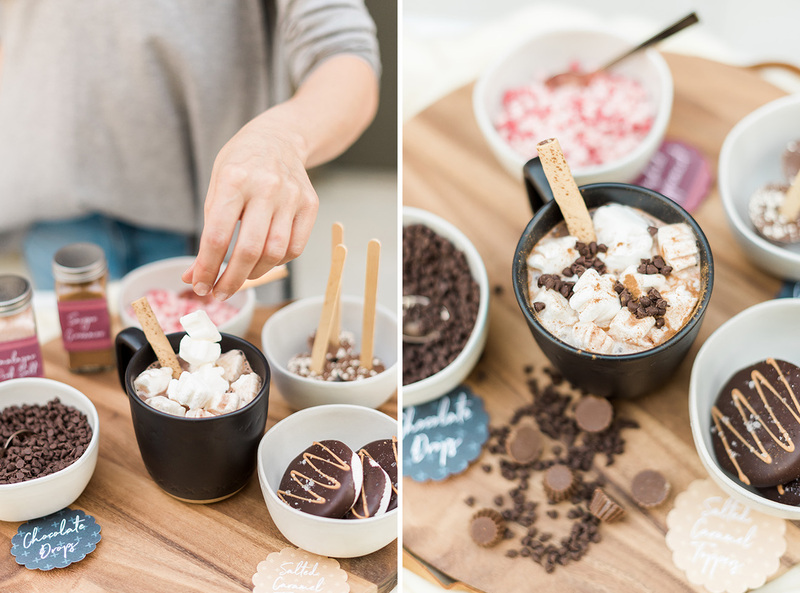 Let’s dive in to all the delicious ingredients and see how to style one darling hot cocoa bar with labels from Avery! P.S. 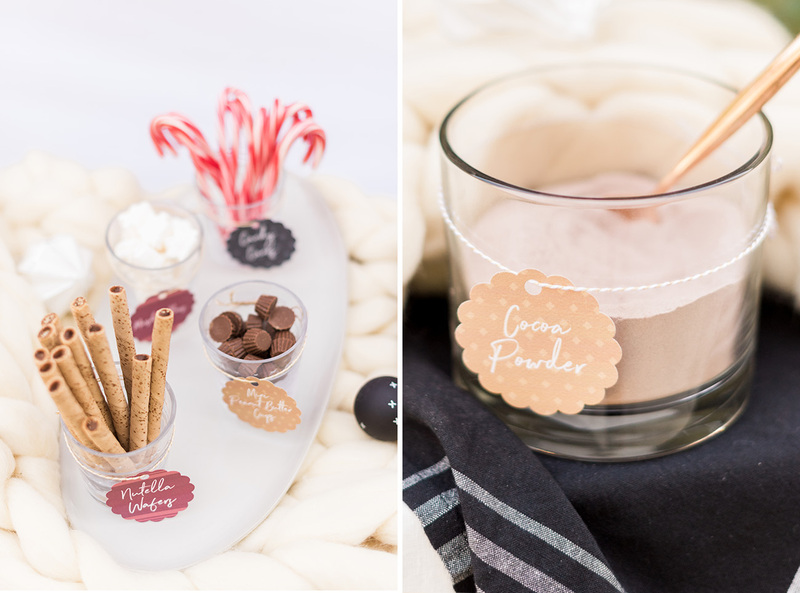 All of our label goodies are available as free downloads to create your own printables at home! It’s all about creating little vignettes + making the whole table/bar extra cozy! 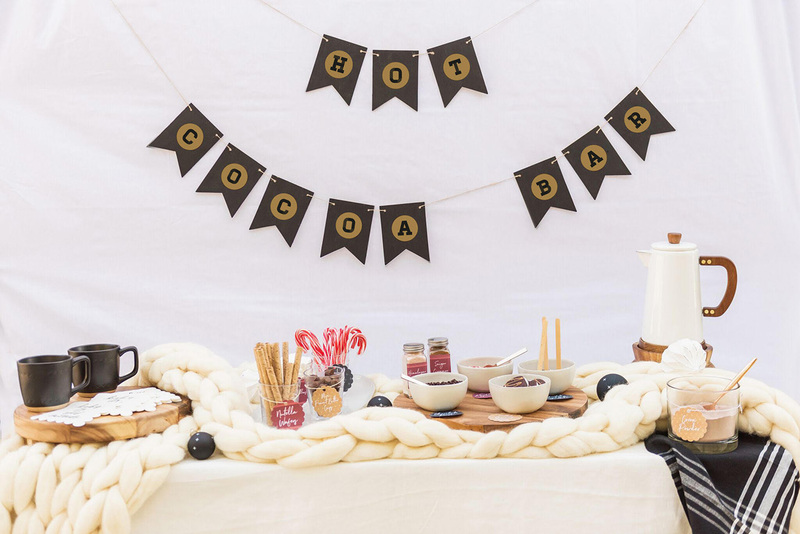 For this, we’d suggest using a base tablecloth, then layering napkins or runners, and if you’ve got a chunky wool blanket like the one above — it would definitely add to the whole wintry vibe. While this setup could work with other colors + prints (particularly flannel for a more rustic/woodsy feeling), we opted for a neutral palette of creamy whites, black and grey, along with natural wood. 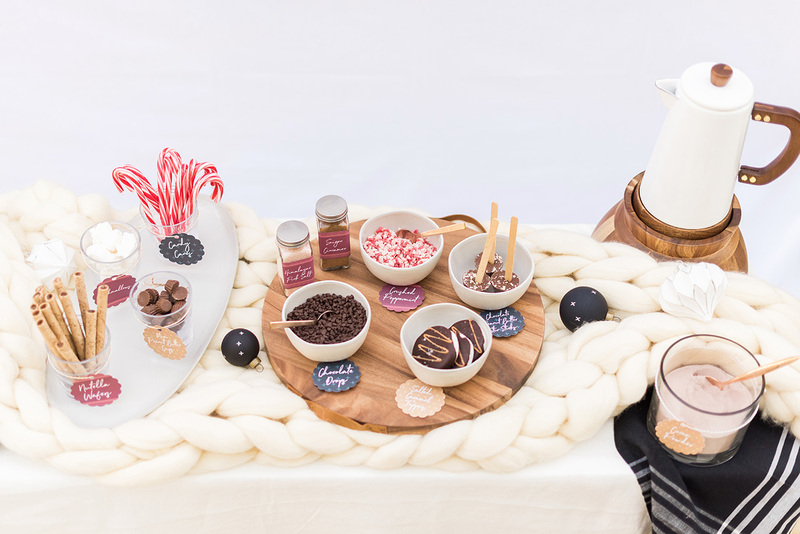 When it comes to levels, you can use large presents (or wrapped cardboard boxes, for that matter), serving platters, cake plates or bowls to create platforms. 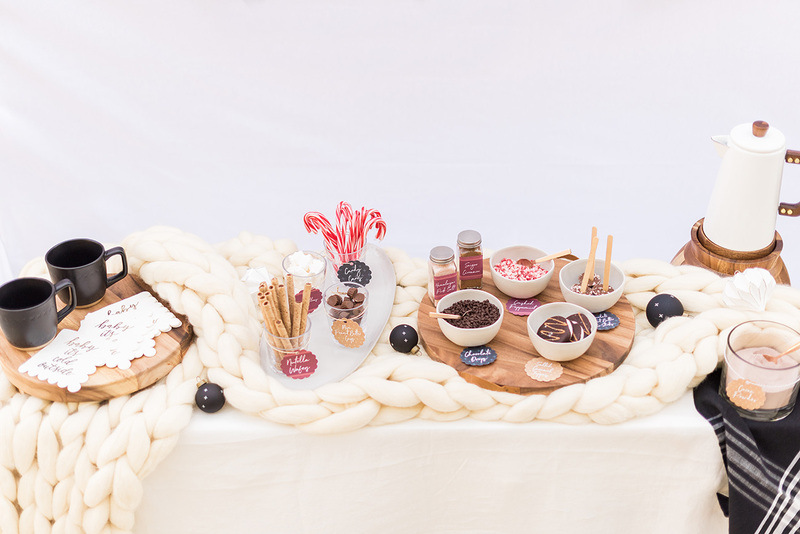 Having items displayed on different levels adds a bit more interest — plus this helps prevent different toppings from getting lost within the whole tablescape. As for the ornaments, we opted for these darling patterned ornaments from Target! Other things that could be cute: small wreaths or freshly cut pine branches for a touch of greenery, small presents placed throughout, bows, garland, even poinsettia plants! The cozier the better. 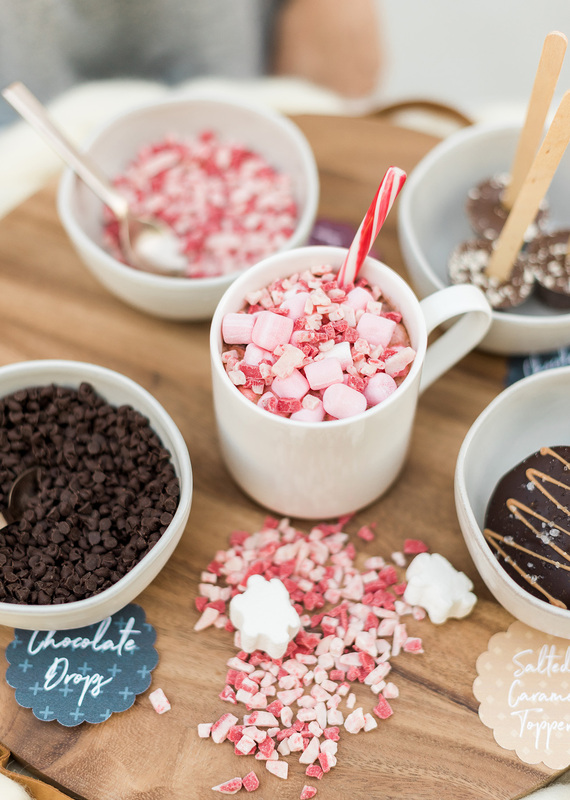 Feel free to GO THERE — from crushed peppermint candy canes, snowflake marshmallows, and chocolate chips, to peanut butter cups, salted caramel delights, cinnamon + sugar, to Nutella wafers. 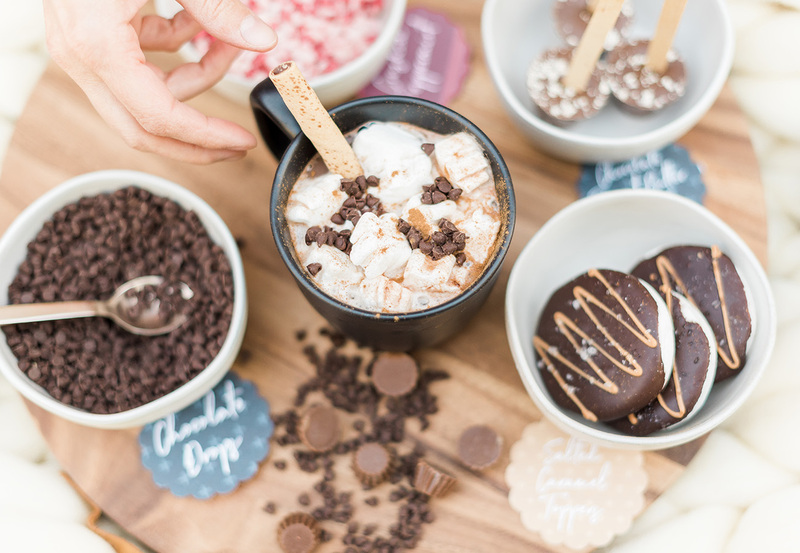 The options are endless… Perhaps even throw in some holiday sprinkles, whipped cream, and chopped Oreos! As much as we would love to keep all of these Hearth & Hand with Magnolia mugs for ourselves, they make for fabulous favor gifts (especially at the price point of $3.99). 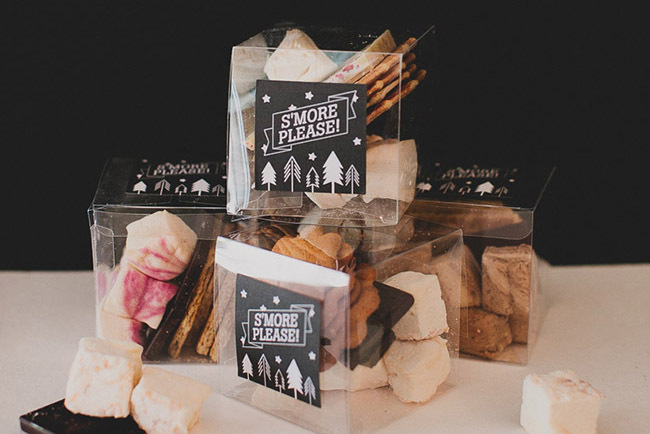 Let your loved ones take home their delicious treats… Plus, that means less clean up for you! 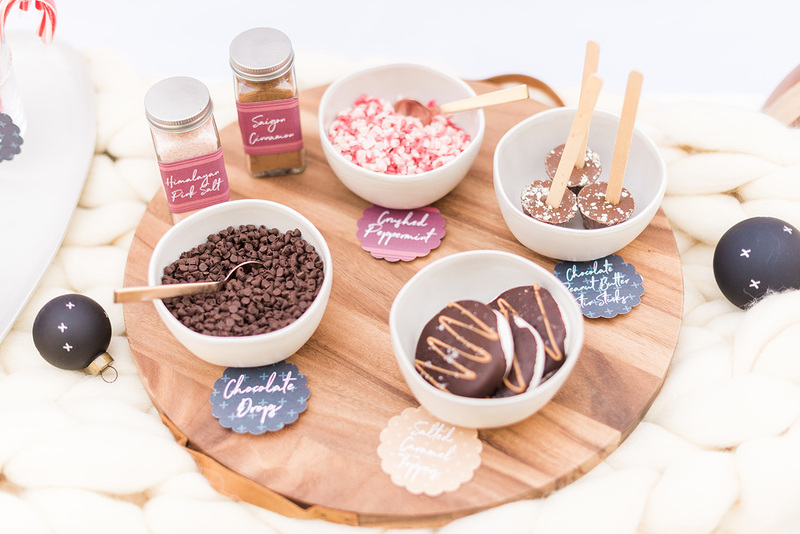 As a sweet touch, perhaps create a personalized tie on label (for the handle) with the name of each guest. 5. Bring on the Booze! 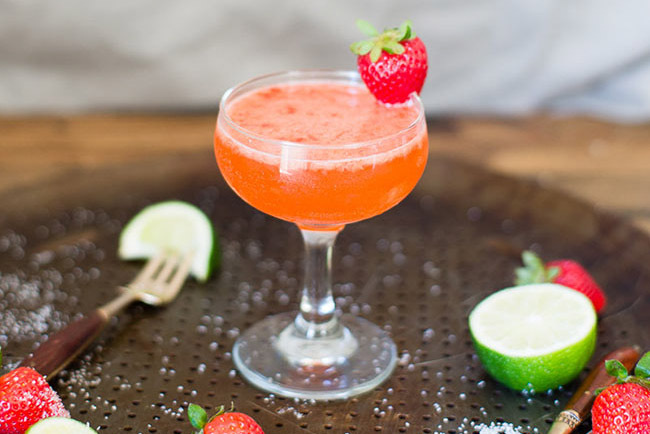 Last, but certainly not least, add a shot of booze for a fun twist! 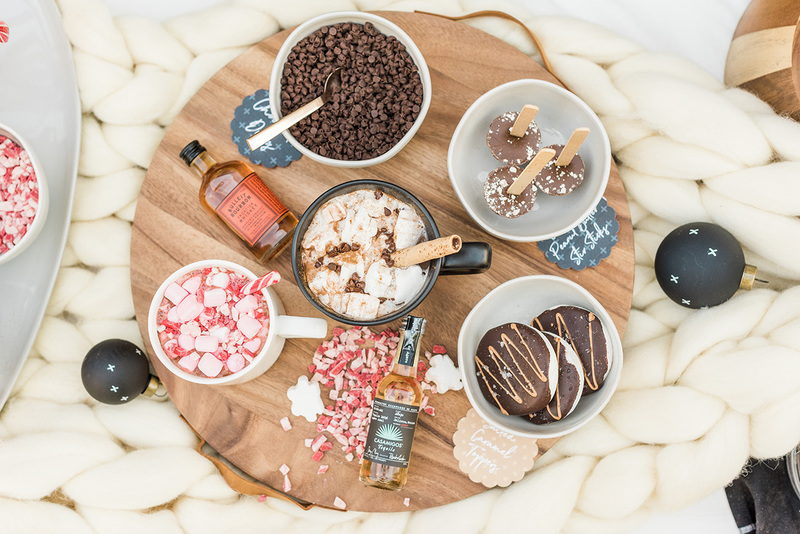 If you want to go more of a White Russian route, opt for vodka + Kahlua, or for an equally delicious hot chocolate take on Irish coffee — add a shot of whiskey. We are personally big tequila fans and love adding a bit of dark Casamigos Tequila and some crushed peppermints on top – YUM! Doesn’t this look absolutely DIVINE?! 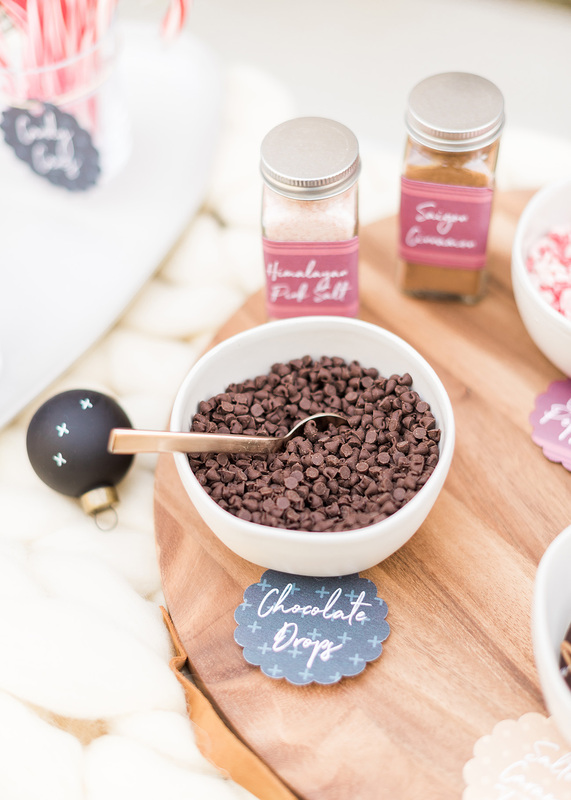 We’d love to hear how you’d spice up a hot cocoa bar — let us know your thoughts in the comments below. Happy holidays, everyone!! This post is sponsored by Avery. All content, ideas, and words are by Green Wedding Shoes. Thanks for supporting our sponsors!